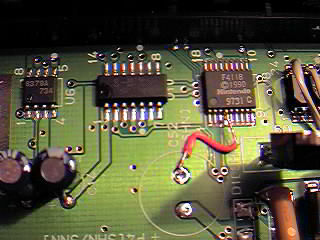 This mod will disable the lockout chip in the SNES, which normally prevents games from PAL territories working in NTSC territories. This info comes from Mark K who turns out to be full of wonderful information. According to him, the info for this mod came from a patent search where it was revealed that disabling the chip causes "an unstable state takes place and no operations are performed at all." For more info, see Mark's exceptional writeup on the topic. Check here for those special GameBit Screwdrivers. All you need to do is open the machine, locate the security chip and cut pin 4, so that it's not connected to the board. Some of the latest releases may not be happy running this way, you may want to install a switch to route this pin to either +5 or Ground. Here is a closeup of a successfully modified Newstyle SNES. Note the absence of a switch means certain games (Like Mario RPG) won't play on this system - you should determine your own needs and add the switch where appropriate.